Planet Waves :: Your Spring Readings -- Get 'Em While They're Hot! Your Spring Readings -- Get 'Em While They're Hot! Would you like a sneak peek at the depth your Spring Readings will offer? Eric has put together some free samples of the readings here. 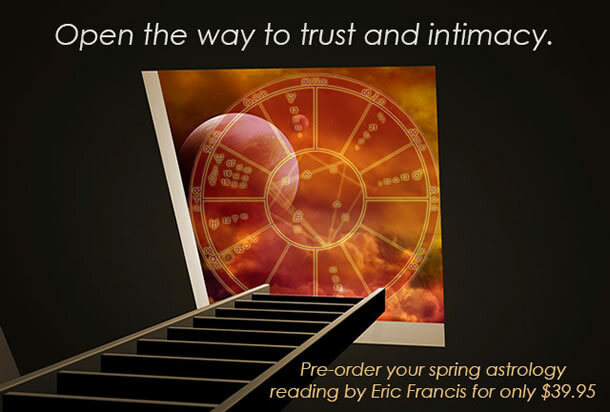 He is very close to completing your Spring Readings -- and there is still time to pre-order all twelve signs for only $39.95 (that's a 33% savings on the published price). This package deal will give you access to the readings for your Sun, Moon and rising sign as well as readings for the people you love. We plan to publish by the end of the week, and the price will go up to $59.95 at that time. Once you've listened to the free audio preview, don't forget to purchase your Spring Readings at the pre-order price right away. This is your last chance to take advantage of our special offer. There is also a free audio preview that you can listen to here.